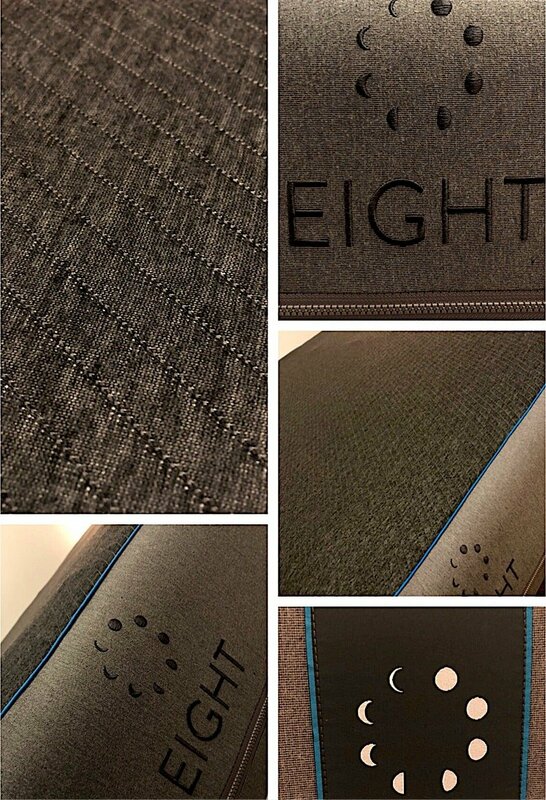 Editor’s note: Just before Christmas 2018 we received an email invitation to test and review a new product innovation from Eight Sleep. At that time, the product was so hush-hush we weren’t even allowed to know its name! Naturally intrigued, we said yes to the invitation and today, on the launch day, we’re excited to bring you our hands on, in-depth review of the The Pod – a high tech bed designed to help you achieve optimal sleep fitness. sleep coaching: calculates your sleep score, provides recommended Pod settings and optimizations to improve your sleep. Lots of data but no direction? But what about validity & reliability? A well-built mattress/smart bed with built-in heating and cooling system with preset options that can be adjusted at will. An integrative sleep tracking app provides a variety of metrics including HR, mattress temperature, sleep/wake ratio, REM/SWS/light sleep phases, respiratory rate, and nocturnal movement. For starters, I must complement Eight Sleep on their superb customer service. I was honored to have two team members from Eight Sleep make a personal visit to help with setting up the Pod. Clearly the company wanted the review to go smoothly, but as it turned out, setting up the Pod with the in-app directions was practically seamless. The mattress itself is a 4 tier microplush foam design with differing layers of density to provide support and comfort while allowing for dissipation of heat. It was shipped in a 4’ by 1’ box but keep in mind you may need some assistance if moving the product upstairs as it is close to 60 or 70lbs. The mattress itself was enveloped in a single woven outer layer, upon which the stitched mattress topper was zipped onto (as shown in the picture above – see uppermost dark gray layer). The hub was fairly small and resembled the size of an average pillow. Even when running at 100% capacity it was quieter than an air conditioner or white noise machine. When you start to run low on water, the app quickly alerts you and saves you the hassle of having to check daily. Pairing with the wireless router was foolproof and the priming process was so easy even a caveman could do it (shout out to all the GEICO fans out there). Overall the construction was exceptionally durable and compared to some other sleep technology I’ve used in the past, this was lightyears above them. I have yet to encounter anything else on the market which compares to the hub in terms of overall capabilities. All in all, I was extremely pleased with how much time and thought had been put into the product. My background is sport science. I want to know the “why” behind the “what”. When we encounter physiological changes, data can often help to provide us with potential hypotheses to explain what’s happening and why. If you’re not familiar with sleep monitoring technology, it’s hot right now. Like REALLY hot, especially in the world of professional sport, performance enhancement, or biohacking. Even if someone has no interest in lifting weights, consuming a nutrient rich diet, or optimizing their lifestyle for optimal health, everyone wants to sleep well. Why? Poor sleep literally wrecks every facet of your life. When you don’t sleep well, you literally turn into a walking zombie. So, if you can get a generalized idea of what’s going on “underneath the sheets” so to speak, this can potentially point you in the right direction of what to change. Here’s what you’ll see with a single night of sleep while using the Eight Sleep mattress and app. Everything from time in bed to body temperature, heart rate, movement, and everything in between. It seems we’re at a very exciting point in the world of medicine, sport, fitness, and health. We have an inordinate amount of technology which can monitor physiological metrics and provide early warning signs if negative trends persist. Data is great as it provides us with the means to an end – change. If you alter something, how do you know it works? Data. However, if you’re just tracking data to have it, then it is essentially worthless and only compounds the ever-growing anxiety over a less than optimal score of any metric. That being said, I’ve noticed some very interesting changes in my personal data with the metrics from Eight Sleep. For example, one of the very first things I noticed was the difference in REM and deep sleep which my wife and I shared despite sleeping in the same environmental conditions (cool, dark room, no electronics, white noise machine, etc.). Take a look below, she’s on the left and I’m on the right. In a single night she’s experiencing almost TRIPLE the REM sleep that I’m getting. 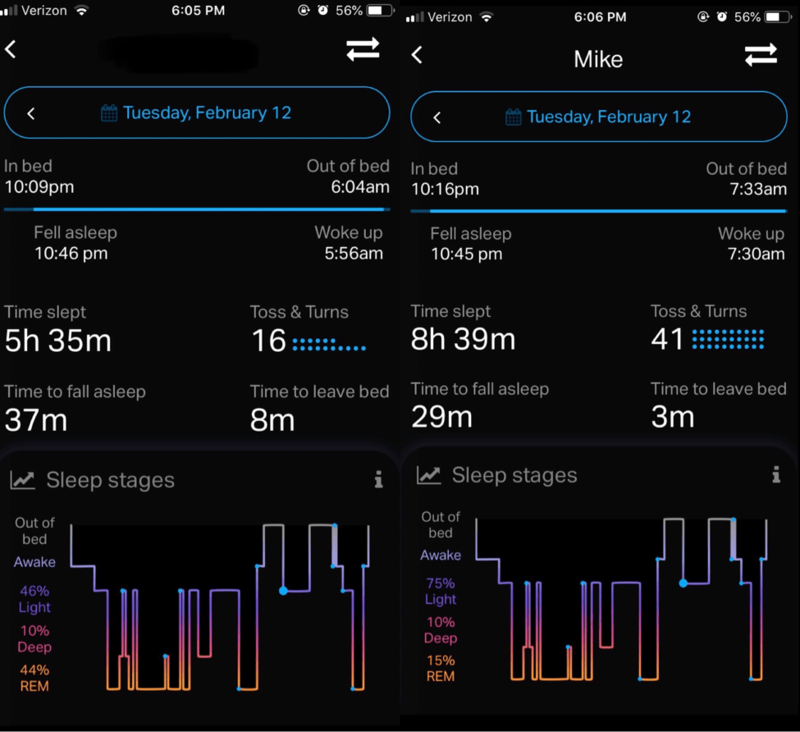 Granted this is only a single night of data but the trend was present over a variety of nights – she was consistently getting an exponentially larger amount of REM sleep each and every night. Now, that raises a very important question – is the large increase in REM due to the fact that she is sleeping “better” (abitrary statement at best and tough to quantify)? Or is her body experiencing a higher demand for REM sleep due to her lifestyle and the cumulative burden of stress which she encounters daily? Without access to other metrics such as bloodwork or even her subjective perception of fatigue, it’s very tough to answer that question. But, it’s rather intriguing, no? However, being the scientist that I am, I started testing a few things. I routinely like to make myself the guinea pig and see what happens. All in the name of science, right? Below you’ll see 4 nights of data – the top 2 nights were routine work days without any exercise or additional sleep aids. I would characterize my sleep as mediocre to moderate at best. I slept but didn’t dream and I woke up feeling about the same as I did when I went to sleep. Now, if you look at the two photos below that, you’ll notice that my REM and deep sleep have both DOUBLED. So, what did I change? On one of the days I lifted weights for about 90 minutes and the other day I utilized 500mcg of sublingual melatonin coupled with 200mg of L-theanine. Even without the data, I could have told you that my sleep was drastically different just in the way I felt. But, the data validated that change and helps me to understand what does or doesn’t improve my sleep. Not only that, with the advent of the pod, you’ll also find the Eight Sleep app includes a virtual sleep coaching interface which walks you through your sleep each night and gives some insight into what’s happening, why it’s happening, and how to fix it. If you’re sleeping poorly and not sure what to do about it, this is going to be indispensable. Currently Eight Sleep is undergoing clinical trials with a number of local hospitals in the NY area and the metrics from the hub are being directly compared to EEG data from patients within sleep studies. As those studies are released we’ll have a much better idea of the validity and reliability behind this exact product and the technology that it holds. However, in the meantime, feel free to dig into the literature on pressure sensors and tri-axial accelerometers as both have been studied extensively within the world of sleep science. Eight Sleep also has a medical advisor team boasting PhDs and MDs who currently practice, mentor, and teach within the realms of neurobiology, psychiatry, sleep medicine, cognitive behavioral therapy, circadian rhythms, and sleep physiology. Occasionally my wife and I found that the sleep tech wasn’t always able to decipher proper wake times when one of us left the bed sooner than the other. For example, there were a few days when I would arise 90-120 minutes before her but my sleep data would claim that I stayed asleep until she finally got up. I’m guessing this may have been due to the fact that we were both sleeping near the center of the bed and thus it’s tough for the tech to discern when one body moved if both are position in a centralized location. Now, from a practical standpoint, does this really matter? In my opinion – no, absolutely not. While it may skew your sleep data slightly this probably occurred once every 8-10 days and in the grand scheme of things, not really a big deal. If you’re interested in the realm of sleep enhancement, then you’re probably aware of the data which has surfaced over the last 10 years documented the influence of wireless technology (Bluetooth, Wi-Fi, generalized EMF, etc.) on brain wave patterning. So, as a general rule of thumb, I usually turn off our Wi-Fi nightly and anecdotally I’ve noticed quite a difference in my sleep (the clientele whom I work with notice similar benefits as well). However, the hub functions primarily off Wi-Fi transmission once it is linked to your router. As such, it won’t work without a wireless signal. Not only that, your nightly data is sent to the Eight Sleep servers where it is compiled for data analysis and longitudinal sleep trends. So, I’ve been leaving my Wi-Fi on while using the hub to allow for adjustments through the night, but I still place my phone on airplane mode while charging next to my bed and my sleep seems to be moderate for the time being. In the future, it would great to see Eight Sleep devise a work around for this which allows the system to function independent of Wi-Fi through the night and then reconnect each morning once it had been turned back on. Again, this won’t be a deal breaker for most folks as 99% of the population has no idea how EMFs affect their sleep. However, if this is something which is important to you (and hopefully it should be if you want to maximize your sleep), then you may want to consider how you can reduce EMFs during the night while still using the thermoregulatory components of the hub. I’m normally a pretty hot natured sleeper. As a little kid, I would constantly complain to my mom about “hot socks” in the middle of the night which woke me up. As such, to this day I still can’t sleep in socks. Naturally the temperature control aspects of the Eight Sleep technology were exceptionally intriguing given my history. For one, I normally wake up due to poor temperature regulation throughout the night and two, research has shown that the brain needs to drop 2-3° in order to induce sleep and maintain specific stages of sleep. Thus, the hub could be drastically helpful with this. However, I set the hub on -1 (+10 is hottest and -10 is coldest) and found myself waking up repeatedly through the night due to my skin being exceptionally cold. Now, it is February and while my wife does keep the heat cranked up, I’m guessing it may be too cold during the night as the ambient temperature drops outside coupled with the cooling from the hub. Eight Sleep is currently still working on the Smart Temperature control setting throughout the night. This would essentially allow the user to set a specific temperature and the hub would maintain that given temperature via heating or cooling effects to enhance one’s sleep cycles. Also, this smart temperature application would slowly warm the temperature of the mattress prior to your alarm as this will naturally stimulate the body to wake up without light or sound. However, in my mind the real question is this: does the body naturally change temperatures throughout the night due to the corresponding metabolic and physiologic processes that function during different stages of sleep? If so, would a consistent ambient temperature negatively alter this environment? I don’t know if we have an answer for that yet but it’s certainly interesting to consider and something you monitor within your Eight Sleep metrics if you choose to use that option in the future. No one on the market currently has anything similar to the Pod. There are some companies offering heating or cooling systems, not one has sought to combine everything quite like Eight Sleep’s new innovation. As such, it’s nearly impossible to compare other manufacturers given it’s almost apples to oranges. Personally, I thought the mattress was a little firm for my taste (my wife loved it however). We swapped the EightSleep mattress for our other slightly softer king sized version, added the thermoregulatory cover, and personally I think it’s much better. So, if you’re debating on which mattress to get, I would suggest upgrading by at least one model (if not more). You literally spend 33% of your life asleep so if there’s one thing you shouldn’t skimp on, it’s your mattress. Invest wisely and your sleep will pay with rich dividends.